Did you just purchase a local bar or pub, with the intention of renovating it? If so, you probably already know how much the renovation costs will be. Just because you are willing to invest a lot of money into this project, does not mean that you would not like to save some money along the way. Well, you are in luck, because there are many ways to cut costs, without compromising the end result. A new beverage menu will definitely be large part of the project, which is why you should take advantage of the bar menu template. Templates have been utilized for many decades to create specific types of products. Back in the day, craftsmen utilized wood, plastic, and metal to create traditional templates or molds. Today, many web designers utilize software templates to create custom websites. Of course, everyone can utilize this unique technology, since a post secondary education in web design is no longer a requirement. In fact, you can take advantage of bar menu templates right now. Just remember that a drink menu is a necessity for the bartender, server, and the customer, so be sure to choose a design that is comprehensible. How Do These Templates Work? 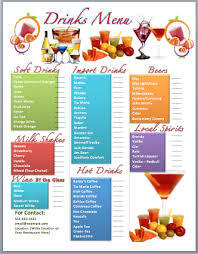 There are millions of bar menu templates available on various websites throughout the World Wide Web. All you need to do is find a reliable website that provides this service. You will find blank and predesigned templates that can be personalized per your specific needs. Most of these templates can be downloaded to your computer, without any further obligations. Once you complete the download, you will simply begin personalizing the template, using different graphics, fonts, and colors. The bar menu template is very versatile, so you can utilize it to create a design of your choice. While, some bar owners prefer the traditional design, others will desire something more unique and modern. If you own a beach bar, you should definitely consider creating a design around this fact. For instance, you can envelop seashells, flip-flops, sunglasses, fruit, and sand into the design. These graphics will definitely bring out the best of your establishment and put everyone in the mood to celebrate. Once your complete your bar menu, you will simply print it in full color, using premium paper with a matte finish. You can do all of this right in the comfort of your home, without spending a fortune.